In a recent interview, First Global Data (OTC:FGBDF)(FGD.V) CEO Andre Itwaru estimated that the company could earn $140 million in revenue and $90 million in EBITDA upon reaching one million subscribers. According to the Google Play app store, VPayQwik, which is FGD's app in conjunction with Vijaya Bank in India, has just surpassed 100,000 installs. Assuming one install per subscriber, FGD is already 10% of the way to its one million subscriber goal. The app surpassed 100,000 installs at 840 ratings so now we have a reasonable estimate of installs going forward based on the growth of ratings as a proxy. I would expect the app to surpass 500,000 installs (the next category on the Google Play store) somewhere around 4,000-4,500 ratings. Given that the company has achieved 100,000 subscribers two weeks into January, is it fair to estimate that from this one deal alone $14 million in revenue and $9 million in EBITDA can be generated in 2017 even with no further growth? That alone would already justify a market cap in excess of $100 million. Keep in mind that the VPayQwik app has surpassed 100,000 installs without iOS availability. The CEO has mentioned to me that he expects VPayQwik to become available for iOS shortly. It was a member of that group who alerted me to VPayQwik's graduation from the 50,000-100,000 category to the 100,000-500,000 category, so as you can tell we share good due diligence and real conversation about our investment in that group. Growth in popularity of the VPayQwik app can be tracked using App Annie. The direct link is here, but you will need to create an account to access it. In the meantime, here is a screenshot of the app's history of growth since its debut on September 19th to today. It debuted at spot #202 in the shopping category within India and has steadily grown to spot #91, reaching as high as #55 in early December at the peak of holiday shopping season (as I write this, I realize that the spike couldn't really be due to the holiday shopping season since ALL apps under the shopping category should see a spike in activity around this time). 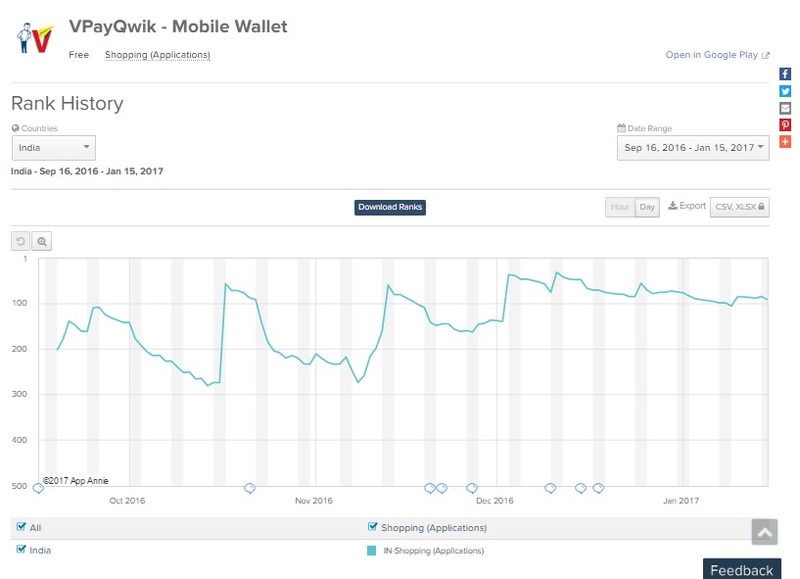 I had erroneously assumed that VPayQwik went live in November when the company first told us about it in a press release, but this does not change my previous analysis where I assumed this app would drive record Q4 revenue and profits for the company. The app was available for only two weeks in Q3 and didn't really take off until mid-October. Disclaimer: The content of this site contains the author's opinion and research. The author holds positions in the stocks mentioned unless otherwise noted and reserves the right to buy and sell securities at any time. The author is not a licensed broker/dealer nor financial advisor. The information provided herein is strictly for informational purposes only and should not be construed as a recommendation to buy or sell, or as a solicitation of an offer to buy or sell any securities. The author has taken appropriate measures to ensure that the information on this site is accurate and reliable and references are included whenever possible. However, the information is presented as is, without guarantee. There is no guarantee that forecasts and estimates presented herein will materialize. Investors are encouraged to do their own research and due diligence before making any investment decision with respect to any securities covered on this site, including, but not limited to, the suitability of any transaction to their risk tolerance and investment objectives.